Core sector growth hit a six-month high in September, adding to a rising set of indicators that show that the country's economy has picked up pace after a disappointing first quarter. 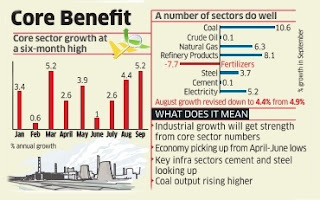 The index of eight core industries -coal, crude oil, natural gas, refinery products, fertilisers, steel, cement, and electricity -was up 5.2% in September, compared with 4.4% in August and 5.3% in September last year. August core sector growth was revised downwards from 4.9%. The eight core industries have 41% weight in the Index of Industrial production, which had reached a nine-month high of 4.3% in August. Strong core sector growth suggests higher industrial output in September. India's GDP had grown at 5.7% in April-June quarter, a three-year low, because of disruption caused by the rollout of the GST and lingering impact of demonetisation. Strong motor vehicle sales, higher air traffic and bigger exports in recent months indicated that the economy is gaining strength. Cumulatively, April-September core sector output was placed at 3.3% against 5.4% in the same period last fiscal. Production of coal, natural gas and refinery products rose 10.6%, 6.3% and 8.1%, respectively, in September. Electricity generation rose 5.2%, and steel production was up 3.7%. Crude output and cement production was stagnant at 0.1% each, while fertilisers output contracted 7.7%. While the growth in cement output is encouraging, given the contraction in the preceding eight months, the pace of expansion is nevertheless muted at under 1%.